These stunning dolphin earrings dangle elegantly from a fine trace chain which threads through the ear. 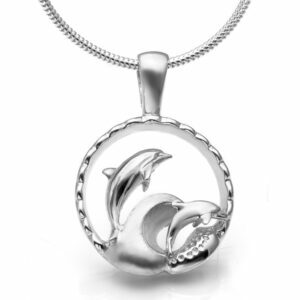 The two dolphins are intertwined in a playful formation. A simple yet elegant design, the earrings complement any of the necklaces within the Dolphin Collection. Available in sterling silver or 9 carat yellow gold (white gold and other metals available upon request). Silver earrings come in our signature World Treasure gift pouch and gold earrings come with a World Treasure gift box and bag. Free shipping worldwide on all orders.